Washington Wizards forward Otto Porter Jr. drives against Miami Heat guard Rodney McGruder during the Wizards' 121-114 preseason win at Capital One Arena in D.C. on Oct. 5. 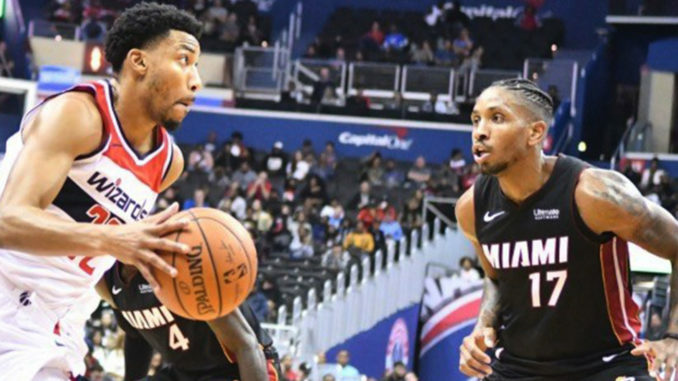 The Washington Wizards scored the team’s first win of the preseason Friday, defeating the Miami Heat 121-114 at Capital One Arena in D.C.
Down by eight at the half, Washington (1-1) turned up the defense to regular-season levels at the start of the third quarter, with a Ian Mahinmi block and four turnovers marking a 14-6 run to tie the game. The Heat (0-3) shot just 39 percent from the floor in the third and were outscored 38-25. All five Wizards starters played more than 20 minutes, which head coach Scott Brooks wanted to get them ready for Oct. 18 regular-season opener, when the two teams will meet here again. 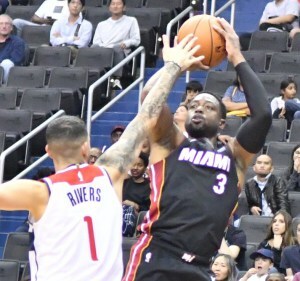 [/media-credit] Miami Heat guard Dwyane Wade shoots over Washington Wizards guard Austin Rivers during the Wizards’ 121-114 preseason win at Capital One Arena in D.C. on Oct. 5. As Brooks said, the team didn’t make a lot of three-pointers, shooting 12-for-39 (31 percent) from beyond the arc. However, Washington shot 51 percent from the floor, included 58 points in the paint. Bradley Beal led the Wizards with 20 points, but shot just 3-of-11 from the 3-point stripe. Miami forward Justise Winslow and rookie Yante Maten both scored 17 points, while veteran Heat great Dwyane Wade, who plans to retire after this season, contributed 10 points off the bench. Washington will go the road Monday against the New York Knicks, which defeated the Wizards in the preseason opener on Oct. 1.